Big Brother Gossip: Memphis Wins Veto! 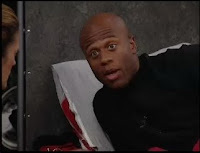 Feeds are back, and at first it was confusing as to who won. The cams were all originally on Michelle, but it turns out that she ALMOST won. Then the celebration in the HOH made it appear as if it was Memphis, but it turns out it was Keesha. Edit: Nope - it WAS Memphis! Here is the opportunity to backdoor Ugly Mike or Turtle Ollie. Oh Happy day........oh happy day... can't say it enough. Really want Ollie to leave first.He is a real crap person), but Michelle is better at comps.... so good bye "Michelle my bell". Time to join your fiends in the jury house.........oh happy day, oh happy day! I did mean friends.but fiends will do! it's keesha..it's memphis...it's keesha...it's memphis. OMFG!!! talk about stress. thank gawwd MEMPHIS WON it. ollie is down stairs just freaking out. he is still thinking dan would never do him wrong! michelle is down in the kitchen slamming and banging everything!! she is at least smart enough (now) to recognize she might very well go up and out...no matter what ollie says! k/d/m/r are planning on taking poor old jerry's 4 thousand dollars even though he is safe. HOT DIGGITY!!! What wonderful news to come home to!!! You got that right, christine...it was PERFECT news to come home to. Now I can continue watching the show. Hopefully dan gives a real good speech so those already in sequester get to hear all about the threats. I'm praying for a Ollie/Manchelle sweep right out the door! And Manchelle should have heeded dear old Jessie a little more when he told her to stick with Memphis!